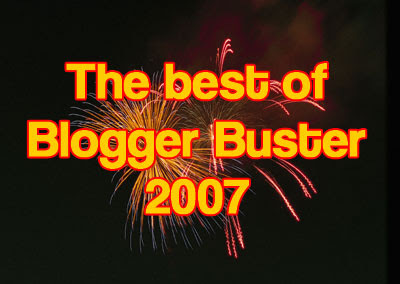 There are dozens of "Best of 2007" posts floating around at this time of year, and in the spirit of things I would like to share with you all a list of the best posts from Blogger Buster in 2007. Although my site has only been online for six months, I thought it would be a good way to remind both faithful readers and newer visitors of this year's highlights. Thank you to all my visitors for helping me develop Blogger Buster into the what it is today. I look forward to a new year of blogging, and have many new features in store which I hope you will all find useful. Get a New Year banner widget for your blog! I hope you have enjoyed reading this post and discovering (or perhaps 'rediscovering') the posts which have helped Blogger Buster develop a string readership and reputation through the later part of 2007. If you've ever wanted to spread the word about Blogger Buster, this post would be a great way for others to discover the best parts of this blog! Please feel free to leave your own comments below. As always, your contributions are warmly welcomed, and your links will be followed by Google!